I had the honor of participating in the Natural Perfumer’s Guild‘s Home for the Holidays event this year and was super excited to be paired up with Andrea Ashanti at Holistic Body Therapy. 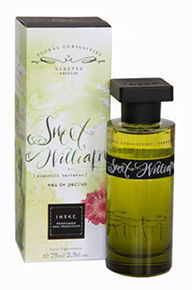 Today’s fragrance is a little different than the norm, it was formulated as a misting spray and can be used as a room spray or on yourself. I’ll be trying both. In Bottle: Celebration gives me the distinct impression of Christmas trees and warm vanilla cocoa with a dash of cinnamon. Applied: Celebration goes in the air and on my skin almost at the same time. In the air, it fills the room with a beautiful dense fir fragrance followed quickly by the warmth of a vanilla, cinnamon and yummy cocoa scent. The gourmand latter really strikes a happy note with me, reminding me of days spent decorating and then curling up under the Christmas tree and drinking hot cocoa while it snowed during the Holidays. The fragrance is light but leaves a fabulous lingering impression in the room for a few hours that seems to uplift the spirit. On my skin, I get a little more mileage as the fir needle note blends in with this rich cocoa fragrance. I get more vanilla and a little less cinnamon on my skin but I also get more frankincense presence near the end of the fragrance’s wear time as it joins the delicious vanilla cinnamon cocoa and helps to further warm the scent. I found myself unable to stop sniffing my wrist and looking forward to Christmas more and more. Extra: Celebration has an impressive mix of ingredients from fir needle, cocoa, vanilla and cinnamon to the Mount Shasta spring water and flower essences that give it a beautiful crisp aroma for a scent that really embodies the idea of Celebration. 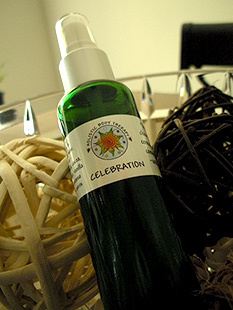 Design: Celebration is bottled in a green glass sprayer bottle with Holistic Body Therapy’s label affixed to it. It’s cute and functional and works great for its purposes. Notes: Fir, cocoa, cinnamon, vanilla, frankincense. The closest thing to a Holiday scent I had before Celebration arrived was a cinnamon and clove candle that would fill the house with a huge dose of spice. My Husband admits he doesn’t like it much and neither do I. I leave it in the pantry with the lid closed and it still manages to scent our beans a little. Cinnamon and clove candle beans are about as delicious as you would think. I was ecstatic to discover Celebration and went crazy spraying it around the house one day near Halloween. The fragrance doesn’t overpower, it lingers but its light. When my Husband came home, his first impression was much like mine, memories of good childhood Christmases in a bottle. You can get yourself a bottle of Celebration for this holiday season at Holistic Body Therapy’s website. At $25 for 2 oz, you’ll get more than enough holiday cheer. Reviewed in This Post: Celebration, 2012, Misting Spray. If you want to check out the participants in the Home For the Holidays Project, try Holistic Body Therapy, Anya’s Garden, Happy Herb Soaps, Belly Flowers Perfumes, and JoAnne Basset Perfumes. Jalaine Silk was an impulse buy that I threw into my cart of samplers at the last minute when it caught my eye and tickled my nose. A white amber with vanilla? I had to know what that would smell like! In Bottle: Sweet but soft aquatic vanilla. Reminds me of a marshmallow sitting in a dish of water. 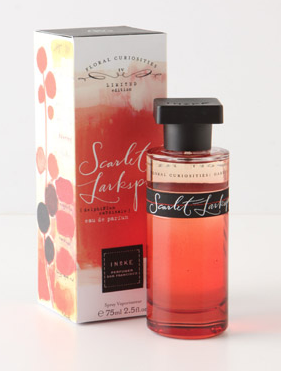 Applied: Silk opens with a sweet, gentle vanilla scent that candies itself up a little with a bit of sweetness. The marine notes that are supposed to be in this give it an almost floral edge with a fresh kick. There’s a hint of warmth as the fragrance develops which is where I assume the amber comes in. If I had to give Silk one word to describe it, I think that word would be “pillowy”. Soft, yielding, comforting, not in your face, not demanding or extreme. It’s unobtrusive and pleasant and one of the easiest going vanillas I’ve smelled and it wears very close to your skin. There’s not a whole lot of complexity to Silk because it comes on smelling like soft sweet vanilla and it’ll generally stay that way for its wear life. But then I guess it doesn’t really need to be an attention grabber. Extra: Jalaine Sommers is an independent perfumer that runs her own website at JalaineFragrances.com offering up some very interesting fragrances in perfume oil form. Of particular interest to me is the green tea fragrance. Design: The bottles are pretty, a simple and effective shape that does well for the juice that it’s holding. Nothing garish or unnecessary in the design here. The bottles do remind me of some of the ultra sharp corners featured in Zaha Hadid‘s architectural work. Notes: White amber, vanilla, marine. I think Silk is a very pretty fragrance and a great candidate if you need to wear something light and vanilla based to work. It’s not the kind of fragrance that will announce your presence. And when I said it was soft and sticks close to the skin, I really mean it. Reviewed in This Post: Silk, 2012, Perfume Oil. Wensleydale is the fragrance I go to after a shower and feel like I need to be as clean as possible. 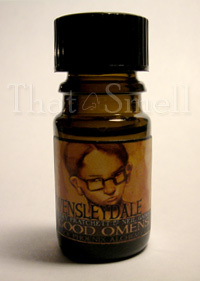 Wensleydale is a part of the Good Omens series of fragrances by Black Phoenix Alchemy Lab. You can find them here. In Bottle: Strong but very reminiscent of a classic bar of soap. Think a bar of white soap and you’ve pretty much got Wensleydale. Applied: Strong waft of soapiness that’s a little bit sharp to begin with, but the fragrance settles down quickly into a warm clean smell with an added hint of sweetness and cream. I get a wonderful mix that reminds me of stepping out of the shower and wrapping myself up in a warm terrycloth robe. There’s not too much else to Wensleydale, it barely goes through two progressions with the sharpness fading into a creaminess and the fragrance fades into a pretty linear clean cotton smell. But boy do I love it because of how nicely it combines warm, clean, fresh, sweet, and creamy into a scent. Extra: Wensleydale is named after a character in Neil Gaimen’s Good Omens book. And the Wensleydale character, in turn, was named after a valley in England. Design: Wensleydale is bottled in the same way as other Black Phoenix Alchemy Lab scents. Amber bottle with a label affixed to it. Wensleydale and the other scents in the Good Omens series feature unique art for their labels. Notes: Cotton, milk, amber, white musk. I have no way of knowing what the notes are in this, so it’s all a big guess on my part. It might also interest potential Wensleydale testers to know that Black Phoenix is donating proceeds from the sale of Wensleydale and other fragrances from the Good Omens line to two charities. Reviewed in This Post: Wensleydale, 2010, 5ml Bottle.